A former teacher is facing 16 charges in connection with alleged sexual assaults involving minors in the Halifax area decades ago. Halifax Regional Police launched an investigation in October 2016 after several alleged victims came forward. Police allege the incidents happened throughout the Halifax region in the 1980s and 1990s and involved three male students. Police say the three alleged victims were youths at the time and that the accused was in a position of trust as a teacher. Officers arrested 77-year-old Jaddus Joseph Poirier at a Halifax address Wednesday morning. Poirier is facing three counts of gross indecency, six counts of sexual assault, three counts of sexual exploitation, and two counts each of sexual interference and invitation to sexual touching, as per the Criminal Codes that were in effect at the time. A publication ban is in place to protect the identities of the alleged victims. Poirier was released from custody after appearing Thursday in Dartmouth provincial court. “He’s released on an undertaking to re-appear in court with conditions including no contact with the victims, remaining away from any residences, places of employment or education of the victims. Also to have no contact with individuals under the age of 18 years,” said Crown attorney Shauna MacDonald. Police say the investigation is ongoing and they are encouraging any other possible victims to come forward. Poirier is scheduled to return to Dartmouth provincial court on May 15, at which point he is expected to enter a plea. None of the allegations has been tested in court. Jaddus Joseph Poirier leaves Dartmouth provincial court on April 11, 2019. 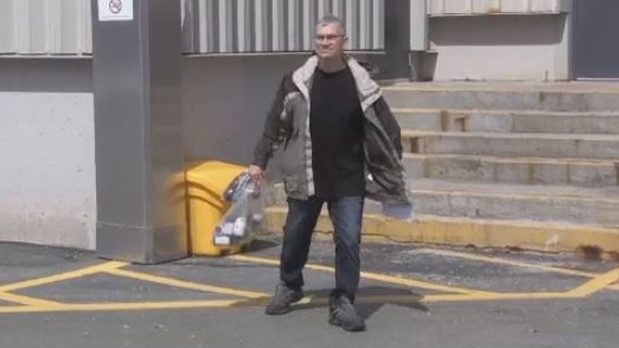 Poirier is facing 16 charges in connection with alleged sexual assaults involving minors in the Halifax area decades ago.